The Pyle Home Theater Hybrid Pre-Amplifier Receiver features Bluetooth streaming ability. Enjoy wireless music connectivity that works with all of today’s latest devices -- like smartphones, tablets, laptops and computers. Pairing your device is easy, allowing for quick connection and hassle-free streaming. High-powered sound processing technology provide the ultimate home theater experience. Connect additional external devices with features including integrated 30-Pin iPod Dock, Aux (3.5mm) Input, Dual Microphone Jacks, Headphone Jack along with Speaker Terminal Connector Binding Posts. 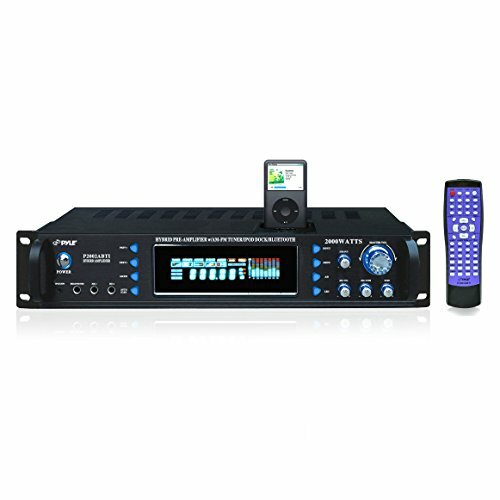 The receiver is rack mountable for compatibility with a wide range of home audio entertainment applications. Get connected with the Pyle Pro Audio Home Theater Hybrid Pre-Amplifier Receiver System. Please refer the instruction and set up video under the image section for help in setting up the product.